- Press your Down button once to highlight "The production from Hell"
- Press your Enter button to see an animatic. - From the Main Menu, select the entry "The Production From Hell"
- On the following screen, highlight the menu entry "Main Menu"
- Press your Left button to highlight a crucifix - Press your Enter button, this will allow you to view a hidden featurette on the fight scenes in the movie. - From the Main Menu, select the entry "Imagining The Underworld"
- On the next menu screen highlight the entry "Hellscape"
- Press your Enter button and you will see a featurette on actor Gavin Rossdale. 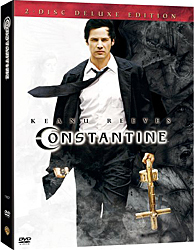 Insert the bonus features (disc 2) into a Microsoft XBOX console (this will not work on a Microsoft XBOX 360) and instead of the bonus features you'll get the demo for the Constantine video game.